Eagle creek was born in California in 1975. They started with a small retail store and today they a highly advanced industry in their class. They are mainly focused on arranging the travel outfit of the travelers in such a way that they have access to all the accessories they need for their travel. Eagle creek is a tribe of innovative travelers that are upgrading their technology day by day to meet all the needs of the travelers. 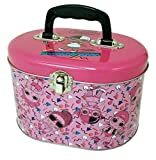 It has a wide range of products such as luggage, backpacks, packing organizers e.t.c. If your travel is organized your mind will be very much free in other important works. For many decades they have provided packing solutions to help travelers stay organized. And when things are organized even the hectic tasks seems much easier. They try to provide you with the maximum space in your bag and ultimately helps you to get a peace of mind and get a track of all the things. By accepting suggestions from travelers and know about their challenges, they manufacture products that enhance along with our needs. By achieving this they have eliminated that extra challenges faced by the travelers and helps them be focused.Eagle creek knows the impact of all types of environments on their products and hence improved the products by using all the latest environment-friendly materials which ultimately increases the quality and durability of the products and provides with the modernly designed very attractive products. And till now Eagle creek is learning from the users and tackling the problems faced by the travelers with a smile all the suggestions and complaints are welcomed by the company and solution will be provided with the earliest concern. The Eagle Creek Tarmac has increased durability and it is a weather-resistant product. A cargo Net for internal or external compression, so to fit a larger luggage in a small space. It has a coat Keeper to protect outerwear of the bag and a very convenient external pocket system to keep small frequently used items in your easy to get places. It is enhanced with lightweight carry technique. TarmacIt seems a bit disappointing for very frequent travelers as some of its stitchings get loose with frequent use and some of its zippers fails if excessively filled. Then needed to repair immediately and can leave you in an unexpected situation. TarmacIt is made up of very solid material and a very impressive quality. Zippers are very much well designed. The wheels are very smooth and roll very easily and very much durable and wheels can be locked or unlocked easily. Its handle has two different locking heights that makes is easier for people of all categories of height. External dimensions are pretty much impressive. And the lightweight construction is the biggest advantage of this product. The Eagle Creek Orv Trunk is an imported with Fabric lining and a full Zipper closure. It is 30″ high and 16″ wide. It has wheels to roll as well as it is very easy to lift with a strong handle. It has water resistant compartments so you can free to us carry it in any weather without worrying about the things inside. Sometimes the corner protective device reflects out and as it is larger in dimensions, it can be over weighted sometimes. We can lock the main and top compartment using only a single central locking point. The flexible thread keeper is very useful in keeping a jacket or small laptop bag in the trunk.It is water resistant and can protect all your important stuff inside it. It is lightweight hence you can pack more stuff without escaping the airline’s limits. It is provided with extra handles in case of failing of a handle you can depend on them quite easily. The wheels are rugged and provide you a smooth grip on rough surfaces also. It has a strong handle and can withstand a large weight. The Eagle Creek EC Adventure is made up of a high quality imported material. It is 28″ in height and 18″ wide. It has four multi-directional spinner wheels which offer effortless movement and a great stability. It provides 10 lockable zippers to secure your main compartments up to a greater extent. It has an expandable main compartment to provide you to pack some extra stuff if needed. The wheels are small in size, hence can stick in some places while rolling over. And it can be soiled easily as it is not much lifted from the ground. The biggest advantage is its four-wheeled structure which is much more easy to handle than the old two wheeled structures. It is more comfortable in carrying larger luggage to a far distance much easier to handle. It is most recommended for longer tours and can be handled very easily in your long waiting hours. The Eagle creek is a best in class brand and made its name in decades, hence they provides you with the strongest and most advanced stuff in the class.So you can work tension free and most important is it provides you free repairs and ready to help you anytime with a smile. It has a record of best customer support and has a large valuable customer army. You can rely on the wide range of products of the company quite easily. It is a perfect gift material also which you can gift to your loved ones and you can recommend it to your partners and colleagues and be sure you will get a positive response from them also. So hurry and get your set of product and explore your passion for traveling and be ready to present yourself every time. COMPRESSION. Expansion zipper increases main compartment by 15% so you can pack and reach your clothes with ease. Then simply close the zipper when you're ready to travel to compact your suitcase to original size. 4 TREADED WHEELS. 4 oversized, heavy-duty wheels in a protective wheel housing and a durable kick plate for smooth mobility and durability. Ultra-durable 360-degree spinner wheels are multi-directional, making maneuvering in any situation effortless. DURABLE. Heavy-duty fabrics provide protection against friction and weather. Shell is lightweight polycarbonate, so luggage is safe without adding weight. Lockable zippers with reflective pulls provide security and easy access, even when wearing gloves. EASY PACKING. Internal compression straps keep clothes wrinkle-free and secure, while external lash points attach extra gear to exterior. 17-inch padded laptop sleeve allows you to reach your electronics without having to dig through your bag. DURABILITY. Built with a seamless Exo-Skeleton that strategically strengthens wear points for maximum abrasion resistance. The corners are reinforced with hypalon material to prevent fraying and protect against drops, while ripstop and ballistic fabrics with bartak add reinforcement and create a water repellent exterior. This bag is built to help you tackle any adventure so you can enjoy without worrying about your luggage. INTERIOR. Compartment on top of bag is great for quick grab items, plus large pocket can act as a laundry shoot or be used to separate gear from clothes. Whether your travels take you internationally or domestically, compression straps inside secure contents and keep clothing wrinkle free. ALL CONDITIONS. The oversized treaded wheels are in a protective wheel housing for smooth mobility to easily maneuver over unpaved, muddy, or bumpy surfaces. The exterior lockable zippers have finger-friendly pulls so you can grab them even with gloves on. Reflective accents ensure you stay safe and visible in the dark, no matter where you are. 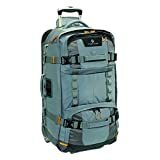 ULTIMATE GEAR BAG. Unique Equipment Keeper can be used to strap gear to the top of the bag and also doubles as a bottle opener. Multiple haul handles and exterior compression straps keep your gear secure and makes it easy to just grab your bag and go. NO MATTER WHAT WARRANTY. 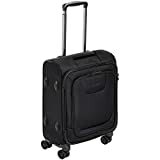 This carry on bag is covered by Eagle Creek's industry leading No Matter What Warranty, which includes the Lifetime Warranty guarantee and repair or replacement due to product failure during product lifetime, regardless of the cause. DURABLE TRAVEL. 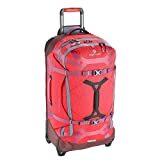 Equipped with two rolling spinner wheels, this duffel allows your luggage to effortlessly glide from rom the airport to the street, and the street to gravel. 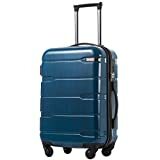 The oversized treaded wheels provide luggage great grip and traction on tough terrain. PACK CONFIDENTLY. Interior compression wings keep items stowed away and packed securely to help prevent movement within your bag. Exterior compression wings adjust to help make sure that all of your belongings fit on-the-go from one location to the next. CONVENIENT ORGANIZATION. A front storage compartment helps keep clothes, shoes and other dirty items separate. A top carrying strap holds jackets, sweaters, hats or other bulky items. Kick off the party upon arrival with a Porter Key bottle opener. Dimensions: 26" x 12" x 16"
BUILT TOUGH. Reinforced corners help keep your bag going strong, adventure after adventure. 100% recycled PET ripstop and recycled coating, as well as a laminated exoskeleton, protect high-wear areas against scratches, scuffs, wear and tear. NO MATTER WHAT WARRANTY. This rolling duffel is covered by Eagle Creek's industry leading No Matter What Warranty. This includes the Lifetime Warranty guarantee and repair or replacement if a product fails during its lifetime, regardless of the cause. The 10 best luggage brands for every travel! Ryanair Hand Luggage: How strict is Ryanair?